The third industrial area to cover about 150 acres. Housing for labour to be inbuilt. Will have a self-sufficient transport area. No big units to be permitted. The city will soon have another industrial area. This one will be located right on the Chandigarh-Panchkula border. The new industrial area, to be spread over about 150 acres, will be between the villages of Mauli Jagran and Raipur Kalan. Already two industrial areas exist in the city having about 3,500 units. These are located on either side of the Chandigarh-Ambala road. All industrial units in the new industrial area will be non-polluting. Instructions on non-polluting industries will be followed strictly as per specifications and guidelines of the Government of India. This is required even more as this is a very ecologically fragile area, sources said. Stress will be on industries which provide allied services like ancillary units and low-end manufacturing, besides trading. To tackle the problem of slums, the architecture wing of the Chandigarh Administration has been asked to design inbuilt housing accommodation for labour which will work in the units. At present both the industrial areas have been surrounded by slums as there is no cheap housing available for the labour. Most of the workers sleep on the roof of the units. This gives rise to the sanitation problems. The exact size of each unit in the new industrial area is yet to be demarcated. It will be as per the requirement but one thing is certain that there will be no big units like the ones located in the Industrial Area (Phase I). A source said new zoning changes allowed in others areas will be allowed and most likely the plots will be on freehold basis. But the plan of the Administration can hit a hurdle. Several middle class people have built their houses in Raipur Kalan village and these areas — about 10 acres — are also listed for acquisition. Probably nobody conducted a field study of the area before listing it out for acquisition. Also under consideration is the issue of allotment of plots to the applicants who had applied under a scheme about 22 years ago. The matter has been pending in courts with the applicants making their own sets of demands. They were scheduled for allotment in the Industrial area (Phase I). The matter is under review in the Supreme Court. While the UT police came under fire for its action on the campus yesterday, the Panjab University authorities succeeded in convincing the agitating students to call off their protest, here today, after working out an “amicable solution” to the satisfaction of the students. Peace returned to the campus this afternoon after the students on fast accepted juice from the Vice-Chancellor, Prof K.N. Pathak, outside the hostel premises following the assurance that a new warden would be appointed for Sarojini Hall (Hostel No. 9) with effect from July 1. The hosteller, Jaspreet, who had managed to give a slip to the police yesterday to avoid being taken to hospital and continue her fast, also accepted juice. Others offered juice include Meena Arora, Nishu Dubey and Rajnish. However, she condemned the role of the police in yesterday’s fiasco in which protesting students were forcibly removed and the arrest of Santokhwinder Singh Nabha who was still in police custody. Clarifying their position, the university authorities said the UT police had no directions from them and was independently handling the students’ protest. The Dean Students Welfare, Dr Harinderjit Singh, read out an order passed by Professor Pathak which said that “in the interest of university and the students, Dr Veena Sachdeva has offered not to go back as the Warden of Sarojini Hall. Accordingly, a new warden of the hostel will be appointed with effect from July 1. Till then, Dr Ritu Sharna will continue to officiate as the Warden of Hostel No 9’’. Later, the Vice-Chancellor along with the Dean University Instruction, DSW and other functionaries visited the students admitted to the hospital and offered them juice. These students were discharged later in the day from the hospital. Earlier, a committee comprising Mr K.C. Shenmar, Prof S.L. Sharma, Prof Paramjit Tewari, the DUI and DSW met this morning and recommended “working out an amicable solution”. Later, hostel warden Veena Sachdeva was also called and she offered not to go back. This was accepted by the committee. Professor Pathak said the committee had worked out the solution keeping in mind the viewpoint of the students. “However, a detailed report in this context would be submitted by the committee tomorrow,” he added. Despite working on several theories in the murder of a Sector 26-based trader Ramesh Chawla, the police was yet to reach a conclusion here today. The body of Ramesh Chawla was found in the jungle adjacent to the Panjab University campus last evening. As per police sources, the autopsy report concluded that Ramesh Chawla died of head injuries. The viscera has been sent to Patiala. However, the police today found his grey Santro car (HR 43D 0016) from Hoshiarpur, which Chawla was said to be driving at the time of his alleged kidnapping on June 16. The police has found blood stains on the rear seat of the car, which suggested that Chawla’s body was dumped in the jungle using his own car, after being done to death at some other place, said a senior police official. The car was later abandoned at Hoshiarpur. This also strengthens the police suspicion that more than one person was involved in the crime. The family members had claimed that Ramesh Chawla was kidnapped from the Grain Market but police sources, while accepting the fact that Chawla was kidnapped, said that he might not have been kidnapped from the market. A senior official of the police said that he may have been abducted on way to the market. The police reportedly rounded up several persons for interrogation in the case. A meeting of senior police officials, including the SSP, Mr Parag Jain and SP (city), Mr Baldev Singh in the connection of the murder, took place at the Operation Cell of the police in Sector 26 this evening. After coming out of the meeting, Mr Baldev Singh said that police was working on several theories. He confirmed that blood stains were found in the car of the deceased. Interestingly, a servant of the deceased had failed to identify the body of Ramesh Chawla last night. He was taken by the police to the spot last night. It was only in the late hours yesterday that the body was identified with the help of the victim’s family members. The sources said sandals found near the body of Chawla were same which he had been wearing for sometime now. He was wearing his silver kara and even he the clothes he was wearing, had been worn many times before. But the servant had failed to identify the sandals, clothes and even kara. The assailant(s) had tried to disfigure the victim’s face by using a stone but they did not succeed as the stone was quite heavy, believes the police. Sources that the stone was heavy enough to be lifted by one person. Chandigarh, SAS Nagar and Panchkula here today remained stunned and “insecure” at the grisly murder of a trader, Ramesh Chawla, as the police remained clueless about the murderer withangry traders demanding special security. With the family yet to come to terms with the misfortune, the daughter of Ramesh Chawla fainted today, while traders called their special meetings to vent their anger at the police for their failure to protect the people. The anger of the people was witnessed during the cremation of the trader. Chawla's house wore a sombre look with scores of people lined up to express their sympathy with the bereaved family. Traders alleged that the police could not save the life of Mr Chawla despite the family having reported the kidnapping early in the morning. Friends and relatives of the deceased told Chandigarh Tribune that they were hopeful till 10 pm yesterday but their hopes turned into fear when they were called to identify a body later. Prof Charanjit Chawla had told Chandigarh Tribune yesterday that he was hopeful of his brother's return last night after a meeting with the Administrator, Lt-Gen J.F.R. Jacob (retd) and the police. The deceased is survived by two daughters and wife. The body was cremated this afternoon. Wailing of the family members filled the air with the crowd terming Mr Chawla a gentleman who could not have had enmity with anybody. The alleged murder of the trader has drawn condemnation from the Chandigarh Beopar Mandal, Chandigarh Vikas Manch, Market Committee and the Trader Cell of the BJP. The organisations have criticised the police for leaving the citizens of the city, especially traders, “unsafe.” They demanded special arrangements for the safety of the people in each sector. The organisations alleged the police was more busy in challaning the people than providing security. The Beopar Mandal held an emergent meeting attended by its president, Mr Jagdish Arora, vice-president, Mr Kamaljit Panchhi, Mr Satpal Garg, Mr Subhash Sethi, Mr Prem Kumar, Mr Satpal Gupta, Mr Jagdish Paul Kalra, Mr Diwakar Sahooja and Mr Gulshan Batra. The Market Committee Chairman, Mr Kuldeep Singh, and members, Mr Ramvir Bhatti, Mr Gurdeep Singh Attawa, Chaudhary Rattan Chand and Mr Gurdev Singh, issued a joint statement condemning the incident. The BJP Trader Cell president, Mr Purshottam Mahajan, called the situation in the city as “jungle raj”. The CVM general secretary, Mr Devinder Singh Babla, accused the police of being busy in "making money" than caring for the safety of the people. * Haryana to have its own mental hospital, the site for which is yet to be decided. Chandigarh appears to be far ahead of various states as far as facilities for the treatment and care of mentally-challenged persons are concerned. It is perhaps the only Union Territory or state in this region to have availed itself of a centrally-sponsored scheme to run a 10-bedded hospital at Manimajra. Chandigarh also runs a school for mentally-retarded children and has a half-way hospital for partially cured mentally-challenged persons. The Psychiatry Wards at the PGI, the Sector 32 Government Medical College Hospital and the Sector 16 General Hospital meet the requirements as laid down in the Mental Health Act, 1998, for the treatment of patients suffering from serious mental disorders. Since the problem is not acute and the Union Territory is a small area, the need for a bigger specialised mental hospital has never arisen. The State Mental Health Authority has been active, with the Director of Health Services as its Chairman. On the other hand, Haryana does not have any mental hospital of its own. The state has, however, granted licences to 16 private nursing homes for the treatment of mentally-challenged persons. Though the state proposes to start its own mental hospital, the site has not been finalised as yet. While Chandigarh has already submitted its plan to the Union Health Secretary in compliance with the directions of the Supreme Court, Haryana is finalising its affidavit to be filed by the Chief Secretary. The facilities for the rehabilitation of curable mentally-challenged persons are far from adequate throughout the region. Psychiatrists maintain that in most cases of serious mental disorders, patients respond well to treatment and are invariably discharged within three to six months. There are, however, chances of relapse in these patients who, in the absence of “transitional” facilities, have to be brought back to hospital. There is also a debate on the treatment given to inmates in mental hospitals. The Punjab Government maintains that giving of menial jobs to indoor patients at the Amritsar hospital (mostly by Class IV staff), including the washing of linen and the cleaning of toilets, has been banned. The admission procedure has been simplified and the requirement of court orders for admission has been dispensed with. The Punjab Government has already decided to make the old mental hospital a part of the Institute of Mental Health at Amritsar. The project has been handed over to the Punjab Health Systems Corporation. The corporation has already appointed four senior residents in psychiatry, two clinical psychologists, one biochemist and two computer operators for the proposed institute. An assistant professor of psychiatry has been taken on deputation. In the rehabilitation wing, a number of posts which had been lying vacant for several years have been filled by making contractual appointments. Now the corporation has appointed three clinical psychologists, three psychiatric social workers, two chief occupational therapists, two junior occupational therapists and others. The institute, with teaching and research facilities, will also offer postgraduate courses in psychiatry, clinical psychology and psychiatric nursing. By abolishing certain posts and converting these into teaching posts, the institute will have two professors, two readers, two assistant professors — all in psychiatry — besides two lecturers in clinical psychology and one professor in psychiatric nursing. In addition, there will be 10 junior residents in psychiatry. The PUDA authorities have demanded the payment of more than Rs 6 lakh from a former SDM of the town as rent for occupying a PUDA house during his posting here. The former SDM, Mr Jai Pal Singh, had stayed in a 600 sq yd double-storeyed house in Sector 52 for about two years. The house, along with another one, had been built by PUDA for its officials of the level of the Additional Chief Administrator (ACA) and the Chief Engineer. It is learnt that Mr Jai Pal Singh had written to the PUDA Chief Administrator (CA) on May 23, 2000, that there was no government accommodation in the town for the SDM, but one of the houses constructed by PUDA for its officials was lying vacant. As such he requested the PUDA authorities to allot the vacant house to him. The CA then asked the ACA to allot the house to Mr Jai Pal Singh, which was done soon after, though the allotment conditions and the rent to be charged were to be spelt out later. The PUDA authorities, later, intimated then SDM that the rent for the house allotted to him had been fixed at Rs 26,100 per month according to PWD norms. According to sources, Mr Jai Pal Singh then approached the Ropar Deputy Commissioner on January 5, 2001, stating that as the SDM was entitled to rent-free accommodation, he should intervene and get the house categorised as rent free. On March 15, 2001, an Executive Engineer of PUDA wrote to Mr Jai Pal Singh that the latter owed Rs 2.61 lakh as house rent to PUDA till March 31, 2001. Correspondence in connection with the house rent continued for a long time between PUDA and the then SDM. It is learnt that the former SDM deposited Rs 12,660 on April 19 this year. Last month, the PUDA head office in Chandigarh asked its local office to give details as to when the house was allotted to the SDM and how much rent he owed to PUDA. PUDA authorities told the head office that the SDM owed more than Rs 6 lakh as house rent to PUDA till April 30, 2002. A notice was then served on Mr Jai Pal Singh by PUDA last month stating that house should be vacated as it had been allotted to the PUDA General Manager. The allotment then was cancelled and the accommodation was reallotted to the PUDA Estate Officer. The police today booked two student leader of Panjab University in connection with a group clash which took place at Students Centre on March 8 this year. The police yesterday booked the outgoing president of the Panjab University Campus Students Council, Santokhwinder Singh Nabha, in the same case and he was today remanded in police custody till June 20 by a local court. Malwinder Singh Kang, president of the Panjab University Students Union (PUSU), and Harbir Singh, chairman of the Students Organisation of Panjab University (SOPU), were arrested by the police in connection with the March 8 incident in which the two students organisations had attacked each other with swords and batons at Students Centre on the university campus. Interestingly, Malwinder Singh Kang and Harbir Singh were admitted to the General Hospital, Sector 16, after they were picked up by the police from the fast at Sarojani Hall yesterday. The police made the arrests after they were discharged from the hospital. Nabha was arrested yesterday from the same venue. On March 16 the two students' organisations had attacked each other resulting in injuries to two persons. On the same day the two student bodies had registered FIRs. *Fire Department asks cinema hall owners not to lock grilled gates to ensure speedy evacuation. *Police feels the locked grilled gates provide safety against any sabotage and terrorist attack. *DC’s office asks cinema hall managers not to lock the doors till people are inside. ‘‘The evacuation routes for the fire safety should be kept ready but opening the main grilled gates will allow an unnoticed entry into the cinema hall to carry out any terrorist act,’’ the Senior Superintendent of Police, Mr Parag Jain, told Chandigarh Tribune. Cinema halls could become a soft target for the fidayeens if gates were kept open, he said. Mr Jain also said he did not know the ground situation emerging from the notice but was speaking from the viewpoint of security. Meanwhile, the cinema hall managers were verbally asked by the Deputy Commissioner’s office today to keep the main doors open while the people were inside the hall. The DC office, however, allowed cinema owners to lock these doors before viewers entered the hall and after the hall had been emptied. The Fire Department was informed by the owner of the Batra Theatre that the grills had been put up for the protection of the people during the hey days of militancy. The theatre owner claimed that they had been permitted by the District Commissioner to fix these grills. Inquiries by the Fire Department from the authorities concerned on the existence of any such order met with failure. Queries from the DC office, however, revealed no such order had been issued by the office in the recent past. The office also did not have any knowledge of any past order to allow putting up grills. The Fire Department had been informed that the fire fighting systems of most of cinema halls were in a ready-to-use position. The department said the Dhillon Theatre, which has been turned into a multi-plex, had been asked to change its inside colour scheme to give a feeling of relaxation to the people. The feeling of comfort had been given from the fire safety angle believing that the viewers inside a hall should have an opportunity to gather their courage in a situation of crisis to sensibly come out as well as evacuate others in a crisis. Normally stampedes happened in crowded cinema halls as a panic reaction in the times of crisis, Fire Department officials said. The SSP said the cinema halls had to have exit routes for evacuation. They should be kept in a ready position for evacuation but security should be maintained on all gates to control crowd as well as check any sabotage attempt. The locking of the cinema hall gates also had a commercial aspect. Canteens run in the halls did a roaring business as the viewers were not free to move out to get food articles because of locked gates. The locking of the grilled doors, however, was not a peculiar phenomenon in the city as it was done all over in the cinema halls in the country. These gates had also been playing a major role in controlling crowd and curtailing the freedom of gate keepers to allow any unauthorised entry into the halls. Employees unions of different state government departments, boards and corporations are in the final stage of making a broad-base non- political front to oppose the recommendations of the Public Sector Disinvestment Commission. A delegation of the employees union would soon meet the Speaker, Punjab Vidhan Sabha, Dr Kewal Krishan, to demand that a privilege motion should be moved in the Vidhan Sabha, on behalf of the employees, to discuss the disinvestment issue in detail in the state assembly. Most of the employees unions in the state have already rejected the recommendations of the disinvestment commission, on the plea that former bureaucrats, who are responsible for the downfall of PSUs, could not be trusted to make recommendations like retrenchment of workers and privatisation of corporations. Union leaders have urged political parties to debate the issue in the Vidhan Sabha and form an MLAs’ committee to discuss the case of each department and corporation individually, instead of making generalised recommendations. The federation organised rally in Sector 17, here today, as part of the statewide movement against the recommendations of the disinvestment commission. Another rally was organised by the Punjab State Ministerial Services Union, Employees of Cooperative Banks in Punjab and Land Mortgage Banks Employees Union in Sector 34 to protest against the recommendations. Mr Dhillon said the number of employees’ federations including workers’ unions in the PRTC, Punjab Health and Systems Corporation, Tubewell Corporation and a number of Leftist and even unions affiliated with the Akali Dal (Badal) have given their consent to be a part of the front. The unions belonging to Markfed, PUNSUP, Sugarfed, PSIEC, PFC, Department of Education, Irrigation, PSEB and others are also participating in the movement. Mr Nirmal Singh Ghuman said Cooperative, boards, corporations and workers/employees mahasangh, had decided to intensify the agitation in the coming days in view of the Chief Minister's public statements regarding disinvestment. The recent summer showers not only brought the temperature down but also relief to the farmers of the peripheral areas of the city who had been spending huge amount on irrigating the fields for transplanting paddy with the help of diesel pumps. Despite claims by the Punjab State Electricity Board of eight hours electricity, power supply has been erratic to the agriculture sector, which has forced a majority of farmers to go in for diesel pumps for irrigating their fields or seek the mercy of the god. Soon after the downpour, the farmers of the peripheral areas of Chandigarh, including Panchkula, Morni, Raipur Rani, SAS Nagar, Kharar, Sohana, Zirakpur, Dera Bassi and Baddi, swung to plough their fields. Moreover, the rain has resulted in a green cover over the land that was lying barren for the last a couple of months. This has helped in growing greenfodder for the cattle. Those who benefitted the most are the residents of Morni, Barwala and Raipura Rani areas who often used to suffer with acute shortage of fodder for the animals. Mr Baldev Singh Saini, sarpanch of Dhandharoo village near Barwala, has expressed happiness over the rains saying that the farmers of the area have got fodder and grass for their animals for at least two months. ‘‘Rains have brought relief to the farmers as the upper layer of land has got wet and fields are suitable for trilling. There would be less consumption of diesel and the pumps would be used to draw lesser water for transplantation of paddy’’, said Mr G. S. Sodhi, a Rajpura-based landlord. Mr Rajbir Singh, another farmer of Lalru, said the area had witnessed low rainfall and the owners of small pieces of land would have to wait for the monsoons. WHEN cities become unaffordable, peripheries explode and slums are created. And Chandigarh is no exception. The Chandigarh Administration, which tries to put the blame on the existing laws for widespread periphery violations, is solely responsible for creating such conditions by its faulty policies and its inability to provide affordable, transferable and freehold properties for low budget buyers falling in the Rs 5-10 lakh bracket. Widespread illegal change of land use by converting the agricultural land into unauthorised colonies in the periphery control area around the capital city, in total contravention of the Capital of Punjab Periphery Control Act 1952, is the result of callous attitude and flawed policies of the Chandigarh Administration. With boundaries earmarked and having little scope for expansion, the city has no land left to accommodate the regular influx of population converging in the city. Migration labour, businessmen, employees and people from other walks of life and those who come to the city for their livelihood want to settle at a place nearest to the city. In an effort to maintain the sanctity of its master plan, the planners of the city do not seem to compromise with the provisions of the existing building bylaws. Hence, the newly perceived and notified Apartments Act, under the prevailing circumstances, won’t make much of a difference to the existing housing problem. Chandigarh, a city of babus and fixed salaried class, has considerable size of population which cannot afford to own a house under the prevailing laws governing the real estate in the city. It is not a question of availability of affordable accommodation in the city or any difficulty in arranging funds for buying the same; the problem is with the taboos and stipulations imposed by the Chandigarh Administration, which stall the smooth transferability of the dwelling unit in the name of the intending purchaser. Interestingly, these taboos and stipulations are mainly applicable to the low budget properties. Smallest freehold residential accommodation in the city i.e. a five Marla house costs about Rs 20 lakh, which leaves the buyer of the lower segment to opt for housing board/group housing society flats. And for want of easy and legal transferability of these properties due to faulty policies, this segment of buyer is forced to be trapped for such transactions notwithstanding the high risk factor of legal action against such unauthorised constructions. The Chandigarh Administration, instead of putting the blame on legal lacunae, should try to be pragmatic in its approach and come forward with people-friendly policies. 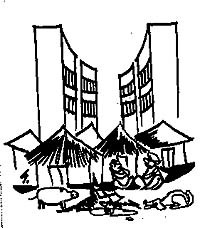 Once the housing board\group housing society flats, which are otherwise lying vacant in plenty for want of easy transferable policy, are thrown open for easy and legal transfer/sale, the low budget buyer falling in the segment of Rs 5-10 lakh shall get adjusted within the city itself, leaving little scope for unauthorised purchases. The lack of buyers shall automatically prove to be a deterrent for unauthorised transactions. However, loopholes in the legal process, if any, should also be plugged. A policy of timely action against unauthorised ramshackle construction by fixing responsibility on the law enforcing agencies of the area to check such constructions well in time, need to be formulated expeditiously. Apropos of the report ‘Child labour problem persists at brick-kilns’ (Chandigarh Tribune, May 28), it is sad that little children are exploited in more ways than one. That this goes on despite legislation makes it all the more repulsive. But it is perhaps easier for the likes of you and me to make judgements sitting safe in the knowledge that the evening meal is not going to be any problem, with fixed income and other sources to bank upon. Who would like their little children to bear the burden of beasts, if they can help it? Unfortunate though it is, the ground reality is that people have to be fed. They have to be fed well is another point, so that they would be able to contribute meaningfully towards society. For these ‘children of a lesser god’ as you call them, a working child means another earning hand. And another helping hand means another couple of rupees to buy a little more ‘daal-bhaat’ or ‘tea and rusk’ to help them sustain themselves through yet another day of the toil. And this alone is the stark reality of their lives. It hurts to see it happening everyday all around us, but only a revolution can make some difference in the present set-up. Do I sound overly sceptic? I had a bitter experience with the station staff of Ambala City railway station recently. On June 2 morning, when I reached the station with my family at 8 a.m. to catch the Bathinda-Delhi Intercity train, the booking clerk behind the counter refused to issue two tickets from Ambala to Sampla. We were to board the train to Sampla to reach my mother who was seriously ill. Repeated pleadings with the booking clerk failed to click. Later, he threw two tickets (bearing the numbers 69896 and 69897) from Ambala to Delhi. I promptly brought this to the attention of the ASM on duty. Instead of helping me, he told me to file a complaint in the complaint book. But he refused to give me his pen to write the complaint. Thereafter, the person who was in charge of the enquiry counter took me to the booking clerk. He issued a supplementary ticket (bearing the number 655745) after repeated pleas. Had the victim been a foreigner in my place, what impression he would have carried about our railway staff? The All India State Bank of Patiala Employees Federation staged a day-long dharna in front of the bank’s zonal office here today. The dharna was organised in protest against the violation of industry-wise settlement norms on mechanisation and computerisation by the bank management. Mr N.K. Gaur, general secretary of the federation, in a press note, said after the implementation of the voluntary retirement scheme, some of the branches were facing shortage of clerical staff, thereby affecting the bank services. The federation also urged the management to consider the appointment of dependents of the deceased employees on compassionate ground. He said earlier the management had agreed to grant Rs 200 per month as lunch subsidy, but now it was retracting its commitment. The union leaders said as per industry-wise settlement, all employees who had joined on November 1, 1993, or afterwards, were eligible for pension. However, the management was not granting pension to those employees who had joined between November 1, 1993, and September 24, 1995, on the plea that they had not given their consent. Further, no bilateral meeting had taken place at the head office level to resolve the matter, he said. The Electricity Department employees under the banner of UT Power Union, Chandigarh, today held protest demonstration outside the electricity office in Sector-43A, demanding the arrest of those residents of Sector 41-D who allegedly manhandled and misbehaved with the employees on duty and also with the children of the area SDO, Mr C.S. Gujral, at his residence, while he was on field duty to restore the supply following a breakdown on the night of June 16. While addressing the demonstrators, leaders condemned the action of the residents and demanded their immediate arrests. The leaders also stated that there was an acute shortage of staff. No new posts had been created even though there was increased work load. Even the posts lying vacant following retirement, fatal accidents, and natural deaths were not filled. The number of electricity connections were increasing, as the number of connections had crossed over 2 lakh but the staff strength was still short, they added. If no prompt action was taken, the union would hold a protest demonstration on June 20, according to a statement issued by the union. 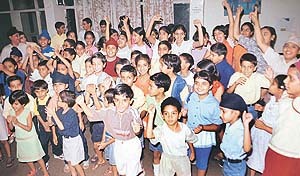 Jubilation marked the first day of the summer workshop organised by the Chandigarh Press Club today in which about 100 children of various age groups took part. The ice-breaking session gave the participants an opportunity to know each other and also were briefed about the courses to be imparted during the next two weeks. The workshop will focus on teaching the basics of theatre, art and craft and dance to the children in a fun-filled way which is meant for not only to keep the children occupied with creative activities but also to help them develop an allround personality. Experts in the related field have been invited for this purpose. The participants belong to the age group of six to 16 years and different modules have been prepared to teach the children according to their age. The workshop will conclude on June 30. The police booked Amardeep Singh of Sector 21 on a charge of cheating under Section 420 0f the IPC and Section 24 of the E.M Act, for duping two persons of Rs 55,000 each on the pretext of sending them abroad and issuing bank cheques to them, which were later dishonoured by the bank. Police sources said that complainant, Mr Mahesh Chander of Sector 37 and Mr Raja Singh of Sector 55, alleged that Amardeep Singh had taken the money from to send them abroad. But neither he send them abroad nor returned their money. Mr Mahesh Chander and Mr Raja Singh, were issued bank cheque of Rs 22,000 and Rs 10,000 respectively, by the accused, which later bounced at the bank concerned. The investigations in the case is being done by the Economic Offense Wing of the police. Chain snatched: In less than a week’s time, one more incident of chain snatching was reported here. Ms Manju Kaushik, a resident of Sector 40, reported to the police that two unidentified scooter-borne youths snatched a gold chain from her neck and sped away on Monday evening. Last week on June 13, Ms Sushil Kaur’s (of Sector 9) gold chain was allegedly snatched by a youth while she was standing outside her house. Molestation bid: A woman of Nehru Colony has alleged that Nanku, a resident of the same colony, forcibly entered into her house and attempted to outrage her modesty on Monday afternoon. Nanku was later arrested by the police and booked under Sections 452, 506, 509 and 354 of the IPC. Abducted: A resident of Mauli Jagran has alleged that his minor daughter has been abducted by Baljit Singh, a tenant in his neighbour’s house. The abduction took place on June 12. A case under Sections 363 and 366 of the IPC has been registered. Scooter stolen: Mr Gurpal Singh, a resident of Ropar district, reported to the police that his Bajaj Chetak scooter (PB 12 D 6227) was stolen from Palsora on June 16. A case of theft has been registered. Theft cases: Three cases of theft were reported in the town in the past 24 hours. Thieves took away some trees after felling them, they also decamped with gold jewellery and Rs 6,500 in cash. According to the police, some unidentified persons cut four khair trees on the land of Thakurduwara temple in Bagbali village, late last night. A case under Section 379 of the IPC has been registered with on the complaint of Mr Udham Singh. In another incident, thieves broke into the house of Mr Daya Kishan in Sector 15 and decamped with two gold bangles and of Rs 6,500. The police has registered a case under Sections 454 and 380 of the IPC. Robbers decamped with a gold jewellery from the brief case of Ms Charan Chawala Gupta, a resident of Ramnagar in Kalka. In her complaint, Ms Chawala said three unidentified youths met her in a Chandigarh-bound bus. She found the jewellery missing after the three left the bus at Old Panchkula. A case under section 379 of the IPC has been registered. One held: The Panchkula police claims to have arrested Kalamudin, an employee of Drish Shoes factory, for his involvement in a theft case in the same unit. He was arrested from Industrial Area, Phase I. It may be recalled that thieves had struck at the factory on Friday night. The police has already arrested — Naraian Ram, Rahul and Ram Pal — employees of the factory in this case. Held for assault: Four persons — Pala, Mushtak, Sitar Mohammad and Ali Mohammad, of Raipur village — involved in a scuffle case near a stone crusher in Pinjore have been arrested by the police. They were earlier booked by the police on the complaint of Mr Gopal. The complainant had also alleged that the accused thrashed him and took away Rs 800. Held under Excise Act: The police has arrested four persons for possessing illicit liquor and drinking on a public place. Hirda Ram of Bhoj Feta village near Morni has been arrested for possessing 11 bottles of whisky while Karan Singh and Gurjor singh of Mattanwala village, Sahar of Ambala and Dhan Bahadur of Kathmandu have been arrested for drinking on public places. Cases under the Excise Act have been registered against them. Seized: The police seized 75 kg of opium from Ram Singh of Guru Nanak Colony. A case under the NDPS Act has been registered at the Phase 1 Police Station. In a three-month old case of death of a 28-year-old NRI, Harvinder Singh, whose body was found hanging in the house of his in-laws under mysterious circumstances in Phase II here, the police has registered a case of murder. Earlier, the police had registered a case of suicide. According to the information available, the case under Section 302 of the IPC has been registered on the basis of vicesra report which stated the cause of death due to poisoning. The victim had lived in the USA for over eight years before he came to India two years ago to marry Satinder Kaur. The victim was living with wife, Satinder, mother-in-law, Sukhwinder Kaur, and a servant Ramu in H. No 821, Phase II. The wife of the victim and his mother-in-law have been arrested. The deceased has left behind a five-month old son from his marriage with Satinder Kaur. Remand: Ms Harinder Sidhu, Duty Magistrate, Kharar, today remanded wife and mother-in-law of Harinder Singh, whose body was found hanging in his house in Phase II, SAS Nagar, on March 22, 2002, in police custody till June 20. Mr Jatinderjit Singh Punn, Public Prosecutor and Mr Madan Singh (Sub-Inspector, Punjab Police) appeared in the court and demanded a police remand for the accused. They informed the court that initially father of the deceased had registered an FIR with the police under Section 302, IPC but after investigations this was changed to Section 306, IPC. They further said that the police had got the report of chemical examination of the body which revealed that the deceased was given poison. According to police investigation the accused Satinder Kaur (wife) and Hardev Kaur (mother-in-law) of the deceased informed the police that the poison was given by them and later they hanged the body. The accused were arrested by the SAS Nagar police yesterday after registering a case under Section 302, IPC. The police said that property of the deceased was the reason of this murder. The industry captains of the region, especially knitting garments, cycle and cycle parts, machine tools and auto parts manufacturers, have hailed the Pakistan government’s decision to slash import duty on 600 items by 10 per cent under the South Asian Preferential Trade Agreement (SAPTA) with effect from June 15. The decision is likely to benefit the machine tools, cycle parts and garment industry of Punjab in a big way. Officials of the Engineering Export Promotion Council ( EEPC), North Region, say that before the escalation of tension between the two countries India was exporting directly and through third countries engineering goods, especially hand tools, machine tools and even sewing machines, worth more than Rs 700 crore. However, the total exports came to almost nil after the escalation of tension. Welcoming the decision of the Pakistan government, Mr Prem Sagar Jain, former president, Readymade Garment Manufacturers’ Association, Ludhiana, said, “The Ludhiana industry, especially the knitwear manufacturers, are likely to benefit in a big way. Though Pakistan has an upper edge in cotton garments, but in synthetics we are likely to gain. However, all calculations would depend upon the Indian Government’s reaction.” The industrialists add that the problem is not only the higher duties but the non-trade barriers created by both countries. Agricultural economists at Punjab Agricultural University are of the view that Punjab farmers would also gain from the decision. Markfed and Milkfed can easily supply foodgrains and milk products to that country. In fact, the Pakistan government has granted India a 20 per cent exemption on some consumer items like potatoes, onions, knitting and punching machines. There is a big market for these products in Pakistan. According to a study conducted at the Economics Department, Punjabi University, Patiala, there is large scope for export of sugar, wheat and processed vegetables in Pakistan and the Punjab can benefit to a large extent. However, the Indian Government should start the railway services as a reciprocatory step that would accelerate the trade. The ups and downs of the trade in plastic raw material has prompted a local entrepreneur to come up with a ready reckoner listing various grades of plastic granules for use by manufacturing units. During good times, it used to be a sellers’ market in plastic. As recession hit the industry, the suppliers resorted to panic sales resulting in a cut-throat competition discounts and wildly fluctuating prices, creating complete chaos. To overcome the situation, Mr Raman Singal, Managing Director of the company dealing in fresh and virgin plastic granules, came up with a novel scheme. He arranged a meet of the regional manufacturers of plastic goods who buy plastic raw material from the company, assured them of stable prices, announced various incentive schemes and signed MoU’s with the manufacturers. Despite a wide variety of choices available, the manufacturing units were not aware of the alternative grades to use for manufacturing various products. They were shelling out extra money and using limited varieties while they could use a different grade, improve quality and get a better rate. The manufacturers also were not sure of the regularity of supply of raw material, consistency in quality, the kind of service offered by various manufacturers and comparative prices offered. Based on his experience of dealing with various manufacturers of raw material, he has come up with a unique handbook in the form of “Raman Plastic Reckoner” that not only gives an overview of the whole situation but also gives comparative charts on regularity in supply, consistency in quality and services offered by the suppliers and also price for same or similar products. It serves as a ready reckoner for specifications of raw material offered by various companies. It also recommends the kind of raw material to be used for manufacturing a particular range of product enabling the manufacturers to take an informed and intelligent decision on what to purchase and why. The reckoner was formally launched here today.